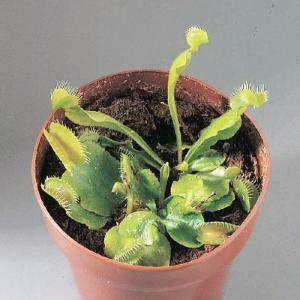 Dionaea sp. Dicot. A fascinating plant to observe, the leaves close around anything that brushes against the inner hairs. Trapped insects are digested by enzymes the leaves secrete. It is native to North America, especially the Carolinas and prefers acidic conditions such as a bog terrarium. It comes supplied in a pot with care instructions. Size: 2– 4".